View of Yevgeniy Fiks, “Adopt Lenin,” 2008. A whimsical variation on this proposition arrives in the form of Yevgeniy Fiks’s “Adopt Lenin” project. Over the past year, Fiks has collected numerous knickknacks bearing Lenin’s likeness, and he presents them here as a museum of lost archetypes: Lenin as defiant intellectual, Lenin as peasants’ champion, Lenin as living monument. Discrepancies among Lenin’s various representations in busts and figurines, on posters and souvenir medallions, are neutralized by his trademark goatee. Fiks’s installation, however, is no simple exercise in typology. Rather, the artist is interested in how since 1989 these items have been transformed from domestic vessels of state propaganda into eBay artifacts of Communist-era kitsch. 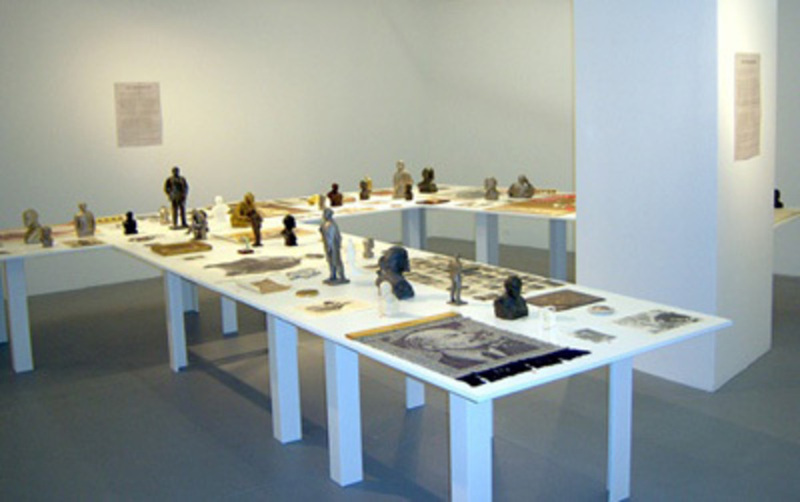 To counter this slide from ideology to commodity, Fiks offers his collection to visitors at no charge; the gesture positions the Lenin memorabilia outside of the capitalist system and within a gift economy—albeit under the stringent obligations of contracts designed to ensure that these Lenins will never reenter the market. “Thank you for adopting Lenin,” a gallery representative said as I signed one of these contracts. Judging by the evenness of his tone, I could have been taking in a curiously named puppy or taking up a discredited revolutionary cause. The latter possibility seems more promising. Writes Fiks, “The choice to adopt Lenin on the part of an audience member is not a manifestation of her/his subscription to communist ideology, but rather an acknowledgment of Communism as one of [the] defining features of the 20th century historical narrative.” That’s the politic thing to say, but hopefully, behind closed doors, Fiks dares to make the bolder claim: that to armchair Marxists everywhere, a Lenin unleashed might still issue a challenge.